So, you have a great banner out in front of your store. You even have a couple matching yard signs, directing customers to your sale. Maybe, you even created a beautiful sign from your logo to adorn your new office space. You’re all set right? You’re feeling really good about the future success of your business . . . that is, until a customer asks, “What time do you close”? 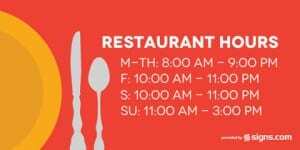 Like a lot of small businesses, having a really professional looking business hours decal on your store or office front door or window is probably an afterthought. You have spent your time, energy and money making sure your other signage correctly reflects your brands image. Unfortunately that handwritten sign with your business hours just won’t cut it. And, that’s where Signs.com comes in! Today, we are pleased to announce the launch of our first ever Business Hours Giveaway. 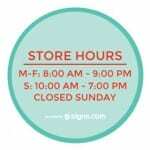 As a thank you to all the small businesses who have helped make Signs.com successful, we are giving away FREE business hours decals to the first 5,000 businesses who visit www.signs.com/business-hours-giveaway and redeem their sign! Yes, you heard that right. Absolutely free, no strings attached. 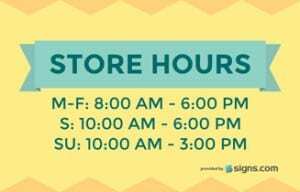 You can pick from one of eleven professionally designed templates that you can customize with your store or office hours. So, what are you waiting for? Head on over to our Business Hours Giveaway page and get your free decal today!